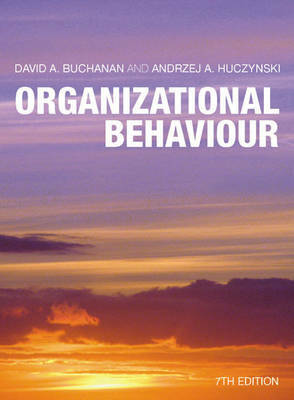 Buchanan and Huczynski bring their well-known and successful brand of critical thinking, social science underpinning, and visual appraisal to bear in this comprehensive introduction to organizational behaviour. Now in its 7th edition, this highly successful textbook has been substantially updated to include the latest research, most relevant contemporary issues and up-to-date practical examples.Organizational Behaviour involves the reader directly, placing you in the position of a decision-making and problem-solving manager, inviting you to see the reality behind an organizational image, and encouraging you to make comparisons with well-known scenes in film and literature.The following online resources support the text:For Students: premium companion website including self-assessment questions, glossary, revision "flashcards", study guide, online audio summaries of key points, video case studies. For Instructors: teaching manual, powerpoint slides, testbank.